IF THE President-elect of France, Emmanuel Macron, does not succeed, the consequences will be “catastrophic”, the president of the Roman Catholic Bishops’ Conference of France has said. The Archbishop of Marseille, the Most Revd Georges Pontier, told Vatican Radio that French RCs were as divided as the rest of France, but that it was imperative Mr Macron was able to govern effectively. “We must hope he succeeds for the good of our country, otherwise it will be catastrophic,” he said. Mr Macron won a crushing victory in the second round of France’s presidential election on Sunday, defeating his far-right opponent Marine Le Pen, of the Front National (FN): his party had 66 per cent of the vote to her party’s 34 per cent. Before the vote, the RC bishops had not endorsed either candidate. This marked a change from 2002, when Miss Le Pen’s father, Jean-Marie Le Pen, shocked France by reaching the second round of that year’s presidential election. That year, the then president of the conference publicly denounced the FN programme as contrary to the values of Christianity, and other bishops followed suit. France’s best-selling RC newspaper, La Croix, did, however, endorse Mr Macron, and castigated the bishops for failing to speak out against Miss Le Pen’s extremism. Before his victory on Sunday, other faith groups had come out in support of Mr Macron, including the Chief Rabbi of France, the President of the Protestant Federation of France, and the President of the French Council of the Muslim Faith. In their joint message, the three leaders said that, while they would normally stay out of party politics, defeating the FN was more important. 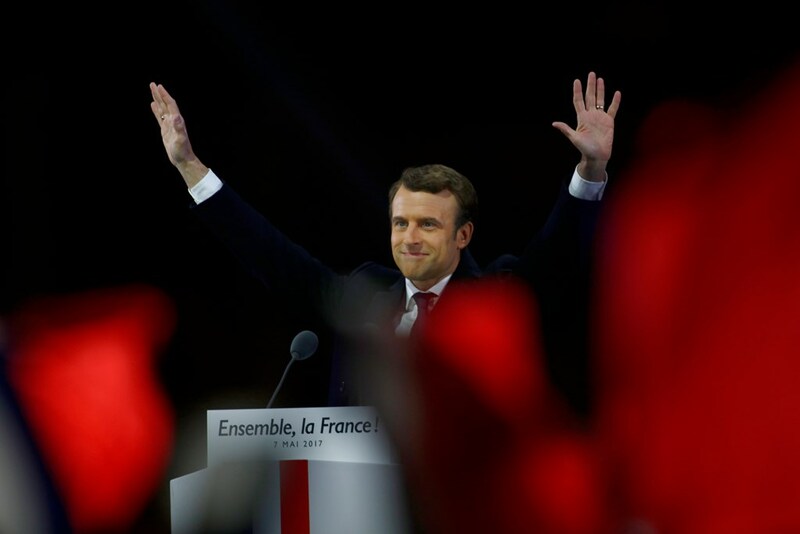 “Only a vote for Emmanuel Macron guarantees a France that is stronger for its history, confident in its future and its ability to shine throughout our world,” they wrote. Archbishop Pontier said that Mr Macron’s pro-EU stance was right for France, and urged him to focus on tackling unemployment, which has been running at about ten per cent for years, and is currently almost twice that of the UK’s. “Priorities for his new five-year term must include struggling against unemployment, which is so destructive for families, for prospects, and for projects, as well as the necessity of staying in Europe — and giving this Europe the means of retaining the respect of every people,” Archbishop Pontier said.